Velvet has always been a fave for me, trending or not. Anything that feels that smooth to the touch should be perceived the same way by all, but for the dissenters + sheeple alike, velvet’s en vogue again for Fall + what better way to step out than in this ‘Black Velvet Piped Coat’ by Isa Arfen?! A bathrobe style coat, the inspo for this piece was 80s Blitz Kids, part of Isa Arfen’s AW16 collection. Sparking the dark mystery of the 80s underground scene, this rich black velvet coat with contrasting metallic gold piping and a self-tie waist, could be dressed down or up + who doesn’t love that? This coat features oversized notch lapels, with long sleeves + a detachable self-tie belt with piping, kept in place by belt loops. With twin slip pockets, satin finish twill lining + a flap vent at reverse, this coat screams subtle elegance. So if you haven’t got a speck of velvet yet in your wardrobe for this season, add this piece to your arsenal. 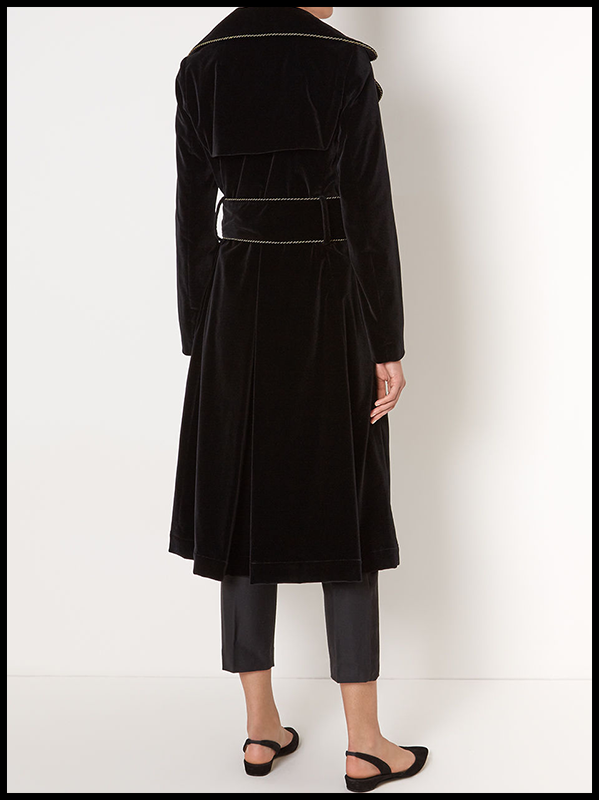 Isa Arfen’s ‘Black Velvet Piped Coat’ can be purchased at Avenue 32.